Grazie per tutte le vostre osservazioni Davide. E grazie per spendere il tempo con la mia cartella. Troppo belle le tue foto per meritare un premio ?? Thanks Peta. I sure am thrilled about the images I got in Rwanda. Going digital and buying fast glass, so I could shoot at ISO 800 and f2.8, let me capture vastly more usable images than I did with film (E100VS pushed to ISO 200) and a slow lens (a Canon EF 100-400 f4.5-5.6) when I shot gorillas in Uganda in 2002. We were also a lot closer to the gorillas in Rwanda for a longer time, so even the experience of being with them was much better. It was an awesome trip! Hello James! Wow, what an amazing little guy...I cant seem to look away from those eyes! Awesome work, you must be so thrilled! Beautiful baby. Very well capture. Good use of DOF. Fabulous capture, trhanks for sharing. Wonderful capture. 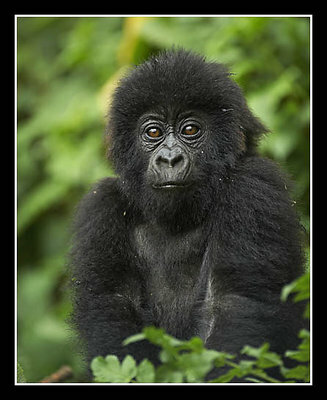 Gorillas have such personality, as seen by your photos.